Wine Oh TV with Monique Soltani Wins Tasty Award for Best Drink or Beverage Program at Star-studded Awards Ceremony. The TASTE AWARDS are the premier awards show celebrating the year’s best in Food, Fashion, Travel and Lifestyle programs! “I'm so grateful to the TASTE AWARDS for this huge honor, they have been so kind to me throughout the years." Thinque Media announced today that the 10th Annual TASTE AWARDS, named Wine Oh TV with Monique Soltani the Best Drink or Beverage Program Online. The TASTE AWARDS is hailed as the highest awards for creators, producers, hosts, and directors of Lifestyle Programs, Series, Shows & Cinema. Wine Oh TV nabbed their fifth Taste Award at Monday night's red carpet event in Los Angeles. In 2018,The TASTE AWARDS named Wine Oh TV the Best Drink or Beverage Program on Television, Best Drink or Beverage Program Online, Best Single Topic Series, and inducted Wine Oh TV into the Taste Awards Hall of Fame. 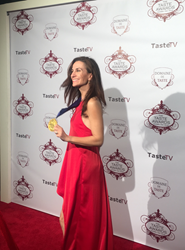 “I'm so grateful to the TASTE AWARDS for this huge honor, they have been so kind to me throughout the years," said Wine Oh TV’s Monique Soltani. "I also want to thank the wine community for trusting me with their stories for the past 10 years. Our production partners in Italy, Granvia Società e Comunicazione, for their hard work and dedication. Our fantastic media partners, TV4 and XUMO, who have introduced Wine Oh TV to a brand new audience of streaming wine lovers. My friends and family for their support over the years, especially this past one. Most of all, I want to thank my daughters for giving me purpose, and my husband, for always believing in me, and showing me everyday that anything is possible." The star-studded TASTE AWARDS ceremony took place at the Writers Guild Theater in Beverly Hills. Award-winners and presenters included: Joanne Weir (PBS), Cat Cora, (Food Network, Iron Chef America), Michelle Harris (Alive and Well TV, syndicated nationwide), Emmy nominated actor Kim Estes, Andrea Feczko (ABC’s Vacation Creation Series, 1st Look TV on NBC), The Potash Twins (Bravo), Melissa d’Arabian (Food Network, Food Network Star), and Jessica Vilchis and Danielle Nottingham (California Live on NBC). Wine Oh TV with Monique Soltani is a fun, fresh and informative syndicated wine, travel and lifestyle show. In September 2016, Wine Oh TV launched their show on Amazon Prime Video. Prime Video is a video streaming service available for Amazon Prime members. Wine Oh TV partnered with XUMO in November, 2016. Wine Oh TV’s channel on XUMO is available to watch on millions of smart TVs around the world. Find XUMO on Channel Plus on LG, Magnavox, Panasonic, Philips, Sanyo and VIZIO smart TVs. Wine Oh TV Executive Producer and Host, Monique Soltani is an award-winning broadcast journalist, TV host and wine pro. Monique has reported for The Weather Channel, CBS, NBC, and ABC affiliates across the country. Monique's niche and narrow focus covering the wine industry over the past 10 years has helped her earn the trust of audiences around the world. Monique is a trained SAG/AFTRA actor and studied at The Groundlings, Warner Loughlin Studios, and The Atlantic Theater Company. Monique can be seen on various films, TV shows and commercials. When she's not creating content and tasting wine, she's practicing yoga, hiking with her husband, and trying to keep up with their 3 year old twins!